Rockefeller philanthropic attention toward public opinion was twofold: 1) to review and establish the psychological environment in the United States for anticipated US involvement in the coming world war and 2) to wage psychological warfare and suppress popular dissent in foreign countries, particularly Latin America. Recognizing how the Franklin Roosevelt Administration was bogged down politically and less capable of planning for war in terms of domestic and foreign propaganda efforts, Rockefeller Foundation-funded projects and research institutes were established at Princeton University, Stanford University, and the New School for Social Research to monitor and analyze shortwave radio transmissions from abroad. The “founding fathers” of mass communication research could not have established their field without Rockefeller largesse. Alongside World War One propagandist and University of Chicago political scientist Harold Lasswell, psychologist Hadley Cantril was a principal contributor to the knowledge and information that helped propel Rockefeller-controlled enterprises and American empire in the postwar era. Throughout this period Cantril provided the Rockefeller combine with important information and new techniques in public opinion measurement and management in Europe, Latin American, and the United States. The work garnered the attention of Rockefeller Foundation Humanities Division officer John Marshall, commissioned by the Foundation with convincing commercial broadcasters to include more educational programming into their advertiser-driven schedules. To this end Rockefeller was funding fellowships at the CBS and NBC broadcasting networks. Aware of the Dartmouth connection, Marshall encouraged the enterprising Cantril to apply to the Foundation for support. Cantril’s request resulted in a $67,000 grant for a two-year charter of the “Princeton Radio Project” (PRP) at Princeton University. 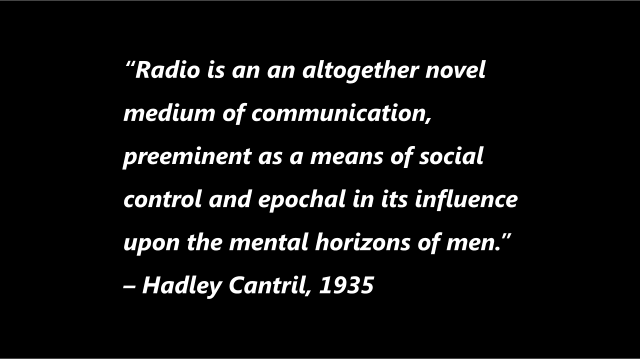 There Cantril proceeded to develop studies assessing radio’s effects on audiences. In 1938 Cantril also became a founding editor of the Rockefeller Foundation-funded Public Opinion Quarterly, an organ closely associated with US government’s psychological warfare endeavors following World War Two. When the Princeton venture commenced another trained psychologist close to Rockefeller, CBS Director of Research Frank Stanton, was named PRP lead researcher but took a secondary role of Associate Director due to his position at the broadcast network. At this time Austrian émigré social scientist Paul Lazarsfeld was recruited to join Cantril. Thus Cantril, Stanton, and Lazarsfeld were closely affiliated and ideally positioned to embark on a major study involving public opinion and persuasion. The opportunity for such an analysis presented itself when CBS broadcast Orson Welles’ rendering of H.G. Wells’ War of the Worlds on on October 30, 1938. Lazarsfeld saw the event as especially noteworthy and immediately asked Stanton for CBS funds to investigate reaction to what at the time was the largest immediate act of mass persuasion in human history. Over the next several months interviews with War of the Worlds listeners were collected, provided to Stanton at CBS, and subsequently analyzed in Cantril’s 1940 study, The Invasion From Mars: A Study in the Psychology of Panic. would supply essential facts on the formation and trend of opinion from peace to war time and from one stage to another under the force of successive war crises. It is expected that further analysis of the data will demonstrate the influence of such factors as family relationship, educational experience, and occupation; the group origins of reported intensity of opinion or apparent lack of it on many issues. In 1940, the Foundation increased the amount of funding devoted to research on public opinion and mass communication to $65,000, with $20,000 apportioned to continuing Cantril’s OPOR. In addition, a $25,000 grant was given to Princeton’s School of Public and International Affairs for monitoring and assessing European shortwave radio transmissions, and $20,000 for University of Chicago political scientist Harold Lasswell to launch an institute at the Library of Congress “for more general studies of radio transmissions, the press, and other media.” A similar shortwave monitoring station was set up at Stanford University to assess transmissions from Asia. Cantril succeeded in predicting voting behavior on important referendums through covert sampling procedures in both the US and Canada. Such achievements brought the young psychologist to the renewed attention of old school tie Nelson Rockefeller, who at the time was a close associate of Franklin Roosevelt. Rockefeller oversaw the State Department’s Coordinator of Inter-American Affairs office, a US intelligence arm focused mainly on psychological operations in Latin America. Given the American public’s apprehension toward propaganda, titles like the one afforded Rockefeller’s agency were intended to obscure such undertakings. A foremost concern of Rockefeller was ascertaining public opinion in South America in anticipation of extending Rockefeller banking and oil interests in the region. In Rockefeller’s view, no longer would power be determined by military control over colonies, but rather through the exertion of “soft power”, where the understanding and anticipation of public opinion figured centrally. To this end in the early 1940s Rockefeller helped Cantril and public opinion impresario George Gallup establish American Social Surveys, an ostensibly non-profit entity that carefully assessed public opinion throughout South America. In 1942 Cantril also began The Research Council, Inc. with initial funding from advertising tycoon Gerard Lambert. Housed at Princeton, the Research Council embarked on a nationwide survey mechanism to monitor public opinion in the US during wartime and in anticipation of the postwar environment. With Nelson Rockefeller acting as intermediary, Roosevelt closely consulted Cantril’s findings in crafting his speeches during the war. The Research Council proceeded to carry out projects for the Psychological Warfare Branch of Military Intelligence in North Africa, the Department of State on US attitudes toward foreign affairs, and the Office of Strategic Services on public opinion in Germany. Cantril’s Research Council continued its activities for US interests in the postwar period, measuring public opinion in France, Holland and Italy to anticipate and quash popular political and social movements. It was later revealed that for much of its existence the Research Council was being funded by the Central Intelligence Agency via the Rockefeller Foundation, a technique often employed by Rockefeller to support a variety of covert projects. Nelson Rockefeller was so delighted with Cantril’s continued public opinion analyses 0f European countries that while working as a psychological warfare consultant for President Eisenhower in 1955, he offered the researcher and his associate Lloyd Free with lifetime patronage of $1 million to continue providing such information. “Nelson had always been a great believer in utilizing psychological concepts and tools for the understanding of peoples”, Cantril recalls. With the formidable sum, revealed two decades later in the New York Times to have actually originated from the CIA by way of the Rockefeller Foundation, the researchers founded a nonprofit entity, the Institute for International Social Research, with Rockefeller slated as one of its distinguished trustees. The Rockefeller Foundation’s interest in domestic persuasion continued apace throughout the war. Between 1938 and 1944, for example, the organization directed a total $250,000 to produce educational and documentary films through the American Film Center. By the late 1940s Foundation officials had developed an even more pronounced interest in opinion management. As the Foundation’s 1948 report read, “An understanding of communication and attitude change is important to our educational system, to those who lead great organizations, and to those who are concerned with political opinion and behavior.” Toward this end the Rockefeller Foundation devoted an unprecedented amount of funding to psychological warfare research. In 1954, for example, a $200,000 grant went to support Yale psychologist Carl Hovland’s attitude change and persuasion studies. Yet with the Cold War as a backdrop such work was increasingly funded by the US military where often the same social scientific talent was tapped that had been groomed under Rockefeller aegis. As historian Christopher Simpson observes, in the postwar era government funding now accounted for at least 75 percent of Lazarsfeld’s Bureau of Applied Social Research and Columbia University and Cantril’s Institute for International Social Research at Princeton. In accord with the more far-reaching educational and social scientific efforts the Rockefeller Foundation saw fit to develop, the elite class to which the Rockefeller family belongs has traditionally failed to distinguish between domestic or foreign subjects as targets for propaganda and behavioral modification. From a perspective that often recognizes national boundaries as obstacles to expanding a certain agenda of political-economic power and control, all are equally subject to similar designs of manipulation and persuasion and the often unwitting acquiescence they cultivate. One need look no further than the legacy of supporting certain philosophical and pedagogical approaches to US public education from the early 1900s that has resulted in a vast reduction of the quality and scope of educational institutions to recognize how the Rockefeller interest in psychological warfare is but a chapter of a much larger saga. This holds true as well in terms of the Rockefellers’ broader philanthropic activities, which from the days of mollifying an outraged citizenry following the Ludlow massacre and John D. Rockefeller’s famous dime dole outs have constituted a thoroughgoing and carefully coordinated exercise in impression management. About the author: James F. Tracy is professor of media studies at Florida Atlantic University. Orson Welles causes a nationwide panic with his broadcast of “War of the Worlds”—a realistic radio dramatization of a Martian invasion of Earth.Orson Welles was only 23 years old when his Mercury Theater company decided to update H.G. Wells’ 19th-century science fiction novel War of the Worlds for national radio. Despite his age, Welles had been in radio for several years, most notably as the voice of “The Shadow” in the hit mystery program of the same name. “War of the Worlds” was not planned as a radio hoax, and Welles had little idea of the havoc it would cause.The show began on Sunday, October 30, at 8 p.m. A voice announced: “The Columbia Broadcasting System and its affiliated stations present Orson Welles and the Mercury Theater on the air in ‘War of the Worlds’ by H.G. Wells.”Sunday evening in 1938 was prime-time in the golden age of radio, and millions of Americans had their radios turned on. But most of these Americans were listening to ventriloquist Edgar Bergen and his dummy “Charlie McCarthy” on NBC and only turned to CBS at 8:12 p.m. after the comedy sketch ended and a little-known singer went on. By then, the story of the Martian invasion was well underway.Welles introduced his radio play with a spoken introduction, followed by an announcer reading a weather report. Then, seemingly abandoning the storyline, the announcer took listeners to “the Meridian Room in the Hotel Park Plaza in downtown New York, where you will be entertained by the music of Ramon Raquello and his orchestra.” Putrid dance music played for some time, and then the scare began. An announcer broke in to report that “Professor Farrell of the Mount Jenning Observatory” had detected explosions on the planet Mars. Then the dance music came back on, followed by another interruption in which listeners were informed that a large meteor had crashed into a farmer’s field in Grovers Mills, New Jersey. We all know about the crude pie-plate-on-string UFO hoaxes that have been perpetrated in the past. But what if I were to tell you the greatest UFO hoax of all time is being prepared right now, and it has Rockefeller backing and UN/Vatican/presidential support?